<<A man who believes the Earth is flat and was ready to launch himself from a rocket in Amboy Saturday afternoon to prove it has canceled his plans. At least for now. Not having the required federal permits plus mechanical problems with his "motorhome/rocket launcher" have forced self-taught rocket scientist "Mad" Mike Hughes to put his experiment on hold. "It's been very disappointing," he said. Hughes is a 61-year-old limo driver who has spent the last few years building a steam-powered rocket out of salvage parts in his garage. His project has cost him $20,000, which includes Rust-Oleum paint to fancy it up and a motor home he bought on Craigslist that he converted into a ramp. Hughes was set to launch his rocket between 2 and 3 p.m. Saturday. Plans had been in the works for more than a year and Hughes said he was initially told by the BLM "that it was up to the FAA" to approve the launch. The FAA, Hughes said, told him "We can't honestly approve it, we just know that you are going to do it there." News of his plans began to spread Monday and gained worldwide attention, which Hughes believes is why the BLM began to push for permits. "My feeling is that one of the top executives at the Bureau of Land Management called Needles, California, saying ... 'What's going on? Who permitted this?'" Hughes said. Plus, as he and his team were preparing to leave Wednesday, the motorhome/rocket launcher broke down in his driveway, he said. And this stupidity is astronomy related how, exactly? The Earth is part of the Universe. An experiment to prove the Universe is flat is Astronomy related. An experiment to prove the Earth is flat must also be Astronomy related. neufer wrote: An experiment to prove the Earth is flat must also be Astronomy related. As the fact of the Earth's roundness has already been established very, very far beyond all reasonable doubt, I doubt your conclusion. The fact that there's a growing flat earth movement, combined with all the other anti-science we see, is something we should all be aware of. 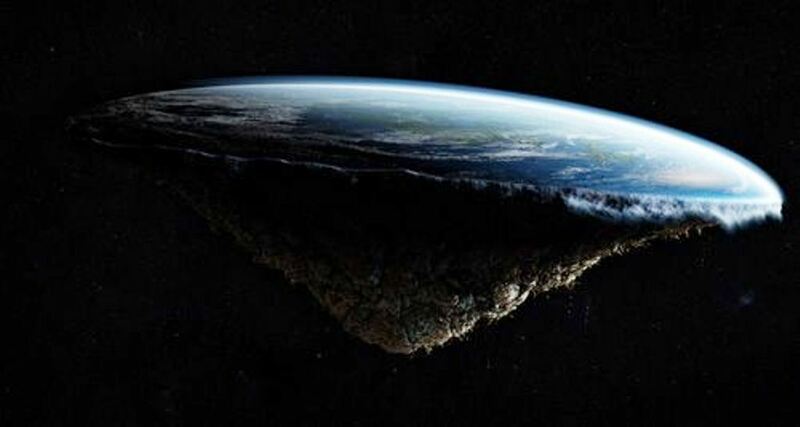 Should Mike Hughes fail to reach orbit that would provide evidence that the Earth is flat. The fact that there's a growing flat earth movement ... is something we should all be aware of. Reading the news. The group is centered here in Colorado, and numerous stories over the last year have pointed to their growth. Of course, it's very unlikely that people with such views will ever amount to significant numbers, but their new existence is symptomatic of the much wider increase in people generally mistrustful of science and willing to abandon solidly established science in favor of crackpot ideas or to match their political ideology. I don't doubt the connection between flat-earthers and those who deny AGW, who are anti-vaxxers, who are young Earth creationists, etc. Also a chicken, since the BLM already said they never received a request for a permit and have never issued any denial of permission. It must be Eastern Colorado. There's nothing flat in Western Colorado. I think the flat earthers just fill the niche that moon landing hoaxers used to fill. The moon landing folks were all the rage when Apollo was going on, but it's been long enough it's not fashionable any longer. Flat earthers can stick it to NASA in all their current research instead of just rambling on about the old days of Apollo. It's a very progressive movement. Mike Hughes's endeavor does...but they both sure generate a lot of media attention. And that's the goal. Period. Do these flat earthers really believe the Earth is flat? I doubt it. They're attention seekers. It would make as much sense (none) to believe that electricity isn't real, but they need that to get their ridiculous message across. BDanielMayfield wrote: And that's the goal. Period. Do these flat earthers really believe the Earth is flat? I doubt it. They're attention seekers. There are trolls, liars, and people who genuinely believe that everything NASA does is one big conspiracy, from flat earth to covering up aliens. It is their nature to act and think in this way. I don't think many of them are doing it for merely attention any more so than you or I are attention-seeking by posting at a forum like this, or making comments on news articles, or begging for funding, or any other myriad of human activities all vying for social attention. There are attention seekers, of course, like the guy with the rocket. The people who organize flat Earth clubs. They're exploiting the gullible. But the majority are the gullible, not the attention seekers. Yup .. some people genuinely don't believe that planet earth is as it is pictured to be from outer space. They genuinely believe the earth is flat. I've met one in person .. and he has, what are to him, logical reasons for his belief. Not a big deal. We're all learning. That is very unfortunate that people can be that gullible and credulous. After considering your and geck's replies to my off the cuff remark I can see that I made too broad of a generalization. Some are lying hucksters, and some are just plain uneducated and well, moronic. Last week I met a teenager who boldly asserted that "dinosaurs are fake". I pointed out places where dinosaur fossils are found, but she remained unconvinced. I did catch her attention though by saying, "Well, you can continue to believe that, but people will think you are foolish." Moronic is such a harsh word I absolutely never use it except to describe internet zombies who go about creating hatred for Muslims, 'Blacks,' etc. I made my comment because just the other night I had observed someone calling someone else "attention-seeker" and I thought to myself that simply describes a human being. Almost everyone needs some attention now and then because we're social creatures. But for some reason when we disagree with what the other person is doing, that need for attention is used disparagingly. The more I thought about it, the more I decided it wasn't a very good way to criticize someone. 'Mad' Mike Hughes's seek for attention is unlikely to harm anyone (other than himself perhaps). Pointing out Mike's shear delight in the attention he was getting wasn't meant to be a criticism by me. Art, I honestly didn't even notice you say that. I mean, you clearly didn't use it in a denigrating way. geckzilla wrote: I think the flat earthers just fill the niche that moon landing hoaxers used to fill. The moon landing folks were all the rage when Apollo was going on, but it's been long enough it's not fashionable any longer. Flat earthers can stick it to NASA in all their current research instead of just rambling on about the old days of Apollo. It's a very progressive movement. I suppose that may be a good description of the current fed-off-the-internet flat earthers, but I can assure you the movement is not anything new. I recall arguing briefly and futiley with one of them back around 1970. He also collected hats -- hundreds of them -- and believed (or so he said) that he could survive on ice cream alone. He wouldn't speak to me after that conversation, having got the correct impression that I thought he was a complete dingbat. I guess flat earthers are like creationists. How do you argue with them? You don't. But I have to admit that flat earthers seem worse than creationists. After all, we can't all travel back in time and watch the birth of the Universe, the Sun, the Earth and life on Earth. There is always the remote possibility that even though scientists have explained so carefully how it all happened, a bearded old man may nevertheless have magicked it it all out of nothing by uttering the portentous words, "Let there be". Fat chance, of course. But you never know. Flat earthers, unlike creationists, have no such excuse. If we only accept the fact that we are too small to see the shape of the Earth from our vantage point here on Earth, there is simply a ton of evidence that the Earth is round here and now. Have the flat earthers never heard of Newton, whose Principia explains why all massive bodies are deformed into spheres? And the gravity of massive spheres explains why we can walk on those with solid surfaces, because their gravity prevents us falling off. I guess the flat earthers haven't heard of this, or couldn't make themselves listen. The only way anyone can honestly believe that the Earth is flat is if this person is convinced that everything that all the arrogant people up there tell you is a conspiracy intended to pull the wool over your eyes. "My story really is incredible," Hughes said. "It's got a bunch of storylines — the garage-built thing. it brings out all the nuts also, people questioning everything. It's the downside of all this." "Do I believe the Earth is shaped like a Frisbee? I believe it is," he said. "Do I know for sure? No. That's why I want to go up in space." <<He finally went up — just like the self-taught rocket man always pledged he would. He came back down in one piece too — a little dinged up and his steam-powered vessel a little cracked up. Still, mission accomplished for a guy more daredevil than engineer, who drew more comparisons to the cartoon character Wile E. Coyote from his critics than he did to iconic stunt man Evel Knievel. "Mad" Mike Hughes, the rocket man who believes the Earth is flat, propelled himself about 1,875 feet into the air Saturday before a hard landing in the Mojave Desert. He told the Associated Press that outside of an aching back he's fine after the launch near Amboy, Calif. "Relieved," he said after being checked out by paramedics. "I'm tired of people saying I chickened out and didn't build a rocket. I'm tired of that stuff. I manned up and did it." The launch in the sparsely populated desert town about 150 miles east of Los Angeles — was originally scheduled in November. It was scrubbed several times due to logistical issues with the Bureau of Land Management and mechanical problems that kept popping up. It looked like Saturday might be another in a string of cancellations, given that the wind was blowing and his rocket was losing steam. Ideally, they wanted it at 350 psi for maximum thrust, but it was dropping to 340. "I told Mike we could try to keep charging it up and get it hotter," said Waldo Stakes, who's been helping Hughes with his endeavor. "He said, 'No.'" Sometime after 3 p.m. PDT, and without a countdown, Hughes' rocket soared into the sky. Hughes reached a speed that Stakes estimated to be around 350 mph before pulling his parachute. Hughes was dropping too fast, though, and he had to deploy a second one. He landed with a thud and the rocket's nose broke in two places like it was designed to do. "This thing wants to kill you 10 different ways," said Hughes, who had an altimeter in his cockpit to measure his altitude. "This thing will kill you in a heartbeat. "Am I glad I did it? Yeah. I guess. I'll feel it in the morning. I won't be able to get out of bed. At least I can go home and have dinner and see my cats tonight." He got permission to launch on the land owned by Albert Okura, who bought Amboy in 2005 for $435,000. Okura was in attendance and said the event lasted about three to four minutes. The rocket landed about 1,500 feet from the launch ramp, Stakes said. "Mike branded us as 'Rocket Town,'" Okura said. "It was amazing." This has been quite an undertaking for Hughes, who lives in Apple Valley. He's seen a flurry of reaction to his plans, with detractors labeling him a crackpot for planning the launch in a homemade contraption and his belief that the Earth is flat. Some naysayers have posted things like "He'll be fine" with a picture of Wile E. Coyote strapped to a rocket. "I hope he doesn't blow something up," retired NASA astronaut Jerry Linenger said as Hughes' plans captured widespread attention. Linenger orbited the globe more than 2,000 times during four months in 1997. "Rocketry, as our private space companies found out, isn't as easy as it looks." That's his project for down the road. He wants to build a "Rockoon," a rocket that is carried into the atmosphere by a gas-filled balloon, then separated from the balloon and lit. This rocket would take Hughes about 68 miles up. Could he see that the Earth is round?